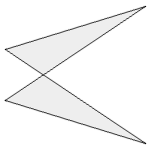 Calculations at an antiparallelogram, a crossed quadrilateral of two congruent triangles. An antiparallelogram has two pairs of opposite sides of equal length. The longer sides b intersect each other and divide into the sections p and q. Enter the length of the short side a and two of the three values b, p and q. Choose the number of decimal places and click Calculate. Angles are calculated and displayed in degrees, here you can convert angle units. Lengths, chords, height and perimeter have the same unit (e.g. meter), the area has this unit squared (e.g. square meter). 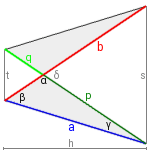 The antiparallelogram is nonconvex, it is axially symmetric to the bisecting line of the outer angles δ.